Welcome to another installment of SIDE BY SIDE, where we dissect the differences and similarities between two films, be it a remake/reboot with its original, a sequel with its original, or two similar movies. 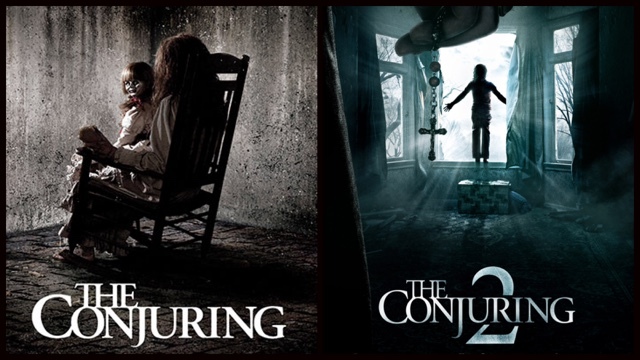 This week we compare James Wan's magnum opus THE CONJURING and the highly anticipated sequel THE CONJURING 2. Enjoy! The Conjuring 2 follows yet another case investigated by Ed and Lorraine Warren (Patrick Wilson, and Vera Farmiga). This time, the case takes place in Enfield, North London where the Warren's are investigating a family who believes an evil spirit is terrorizing them. The Warren's are sent by the Catholic Church to make sure that the story isn't a hoax like the popular paranormal story in America, the Amityville haunting, was believed to be. James Wan partners up with Carey and Chad Hayes for the screenplay again for the sequel instead of his usual working partner Leigh Whannel who Wan has worked with since Saw. But let's get right down to comparing these two films! In the first Conjuring film, The Warren's are investigating a family who claims that an evil spirit in terrorizing their home. As the film progresses we discover that the spirit turns out to be a witch who hung herself in her front lawn named "Bathsheba." The Warren's eventually work together to rid the house of the spirit and save the family being terrorized. Bathsheba is frightening in her appearance to say the least. Her raggedy hair, and pulsing eyes that just pierce into the souls of the audience is terrifying and helps carry the films horror elements to great heights. 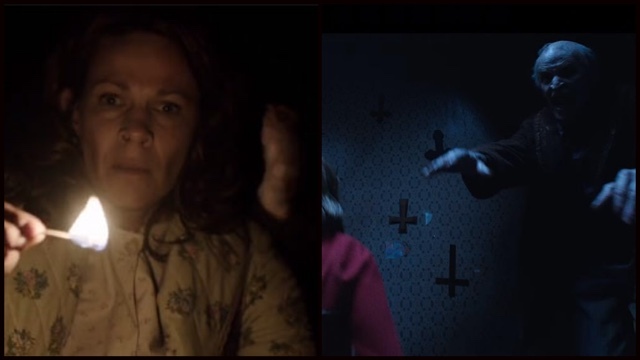 In "The Conjuring 2" we are introduced to an evil spirit that is also a female, who appears as a nun. 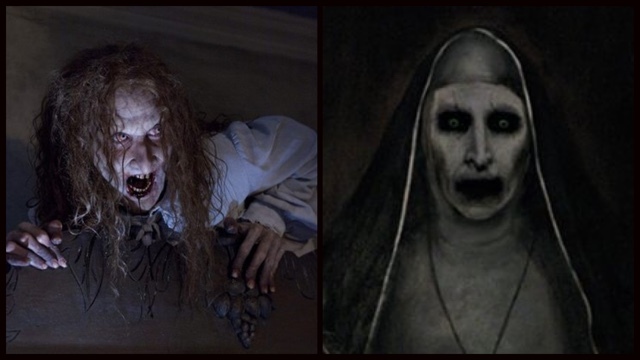 But this is by far the creepiest nun I have ever seen, if we can even call her that. This spirit threatens the Warrens in ways that I will leave for you to discover. James Wan seems to enjoy using females as his spirits, such as in his Insidious films where the main spirit is once again a frightening female. I believe it is because the actresses he chooses have very deep colorful eyes, and they petrify the audience when we get that classic tracking shot towards the face of the spirit. James Wan is famous for the role he has played in the horror genre. But a theme we often see repeated in his stories is that the main evil in the film likes to attach itself to families/children. Often a young child is targeted to fit the agenda of these evil spirits and this makes for a very effective atmosphere to the film. If there's anything we have learned from horror films, its that kids are creepy, and kids with red eyes, throwing people around the room is even creepier. By using this technique of the spirit latching onto a child, it makes the audience sympathize for the family and also makes the family feel incredibly hopeless because they don't want to go through the measures that could possibly harm their child. This in turn connects the audience with the characters, and in a very effective way. If there's anything that has yet to really stand out to me in a James Wan film is the cinematography, but I believe Wan does this on purpose. He enjoys keeping the audience focused on the scares and the story. But, the downside to this is that the cinematography is always very low grade and minimal. There's never any spectacular use of lights or mixing of colors. In other words, Wan does not like to get adventurous with his cinematography. 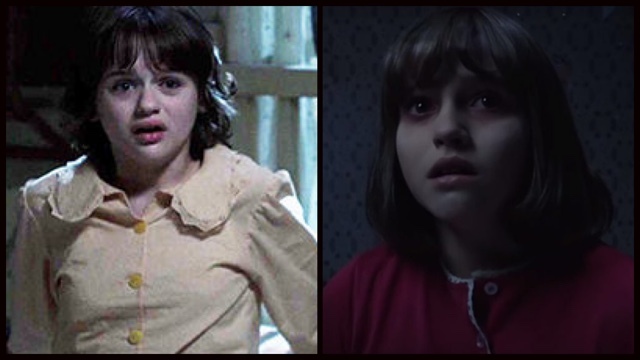 However, in "The Conjuring 2" Wan teams up with Don Burgess, who is famous for working with Robert Zemeckis and boy does Burgess bring a whole new level to the film. From the very first scene of the film, to the lighting that is very reminiscent of old horror films like "Nosferatu" and "The Cabinet of Dr. Calligari", to the swinging, swift camera movements that have you cringing every time the camera goes from one direction to another. The visual style that Burgess and Wan create creeps up to the collaborations of Inarritu and Lubezki, or Tarantino and Richardson, or the Coen's and Deakins. James Wan and Don Burgess could and should continue working together to create not only creepy films, but creepy visually stunning films. James Wan is very popular for his use of jump scares. Insidious, Dead Silence, Annabelle, all of his horror films usually revolve around jump scares and the two Conjuring films are no different. However, the first Conjuring was chock full of jump scares, but the sequel was very creative and smart about how the jump scares were used. From my viewing, I only noticed one jump scare that felt like a James Wan jump scare. Wan is growing as a horror film maker, and is putting other horror film makers and horror films back into the eyes of the public. Several of the scare scenes in The Conjuring 2 had me sweating and cringing as I waited and itched for something to jump out at me or scream at me, but they just continued to drag me along into this terrifying feeling of paranoia. 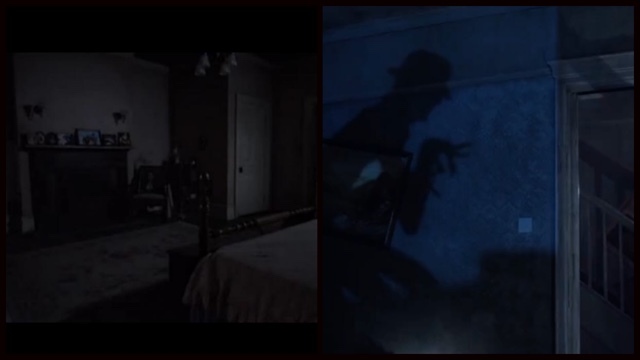 The scare scenes have a decent amount of screen time and they are immensely effective. The audience is just dragged and toyed with as an audience. James Wan just sat back and laughed as we all drudged through the terrifying moments that arrive in the sequel. Wan is slowly but surely becoming a legendary horror film director, a director who's name is up there with David Cronenberg, John Carpenter, and Wes Craven. Wan is making horror films more acceptable in the modern movie going audiences eyes and even with Wan tackling studio films like "Furious 7" and "Aquaman" he still keeps his heart where he began. pretty good review I totally agree with you. second film was on a way more high level. Wan surely has a progress.